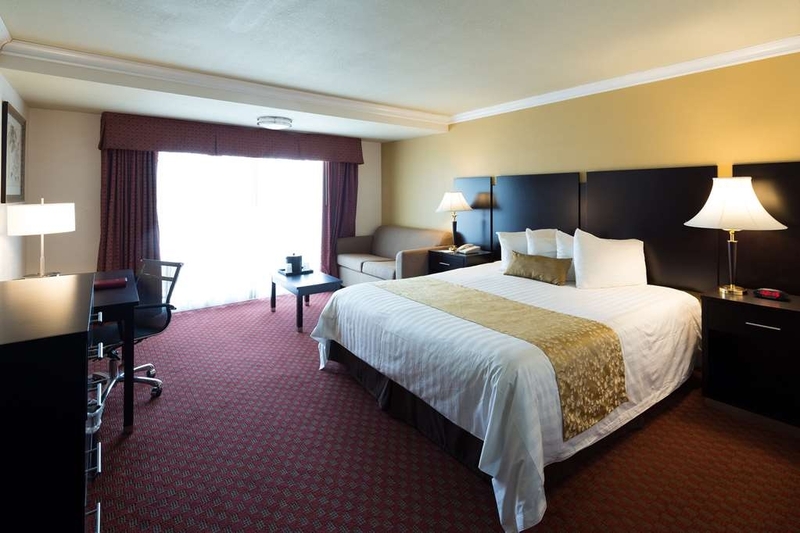 The Best Western Plus South Bay Hotel is ideally located in the center of Lawndale. Come and experience our hotel near the major tourist attractions. Best price guaranteed and exclusive deals. The stay was very pleasant and the flowers were beautiful. I enjoyed the breakfast but wish it was a bit earlier due to we missed it quite a bit because of leaving out to visit with our customers before it opened. I stay at hotels quite often for work and this was a very enjoyable stay. All the staff were friendly and courteous. I stayed at the Best Western for 3 nights and it meet all my needs. The hotel was very quiet and conveniently located. The lobby was nice, the room was clean, and the breakfast was delicious. The 24\\7 shuttle service was a plus. I will definitely be back. "1 night before flying back to France"
I was surprised to find ear plugs in the bathroom when we entered the room. Around 3AM my kids and myself were woken up by people screaming with TV on at max volume in the room next door. Reported the problem at the reception at 4AM who said they would fix it but the noise continued until 5:30AM. That has been one of the most terrible night in an hotel ever. I understood the need for ear plugs. Beside this, we found the breakfast very good. The customer service here is top notch. They take care of you and will accommodate any need. Easy to get around with their free shuttle too. They got a hot tub, not the best in the world but far away from the worst. Relaxing to come home to clean room. "Raising rates and no improvements." I have stayed Monday through Friday at this hotel for over a year. Many of the amenities are broken or out of service, such as laundry, ice machines and elevator. The elevator is out of compliance as its certification was up in 2016. I have continued to stay here as they gave me a decent rate for weekdays. Now they are wanting to raise the rates and charge for parking. There are a fleet of vehicles stored in their parking lot that dont move which has caused difficulty trying to leave to work in the mornings due to double parking. "Broken amenities, plugged drains, bad odors!" I've stayed at this hotel Monday-Friday for the last 14 months on business. Staff has generally been friendly however the hotel itself is again and not been given the care it needs. Drains in rooms are backed up and emit a terrible odor. I've had to cover them wet rags to get the smell to go away. The ice machine is broke most weeks. The laundry facility has been out of order for a month minimum. The pool area isn't locked at random people are allowed to come and go as they please(the hotel isn't located in the greatest of neighborhoods). The spa filtration system is faulty also and leaves the water dirty and omits an odor as well. Lastly, the elevator was out of compliance for 6-7 months minimum is 2018. I was informed they were going to be raising the rates upon this check in and I will not be back. I was already in the process to locate another place to stay during my business in Los Angeles and this was the final straw. I do not recommend anyone staying here because the best western reputation isn't held up here. The staff is friendly and the bed is comfortable but outside of that a motel would be a better fit for the money. Clean hotel with quality furnishings and a full breakfast. Check-in and out were friendly, and the rates made the stay a good value in the middle price range. I was above the pool, which meant some noise in the evening, so there is a location tip, if you want one. I had three bags and not only did the men not offer to assist me, but they failed to inform me that there were carts I could use to take all my bags to the room without struggling. The staff was inconsiderate and impolite, the room mediocre, and the breakfast was marginal. I bet if I were a Caucasian woman I would have been treated better and helped. I felt discriminated. "Nice place to rest from or to LAX. Great breakfast is free." Stay 1 night 12/27 in Room 240. Nothing special in room and around hotel. But this hotel serve hot free breakfast is great, it includes some oriental breakfast items. Many restaurants nearby in just walking distance. This hotel is nearby LAX and offers free LAX shuttle 24/7 which is very thoughtful for a few-days-stay-over in Los Angeles. All the employee are very friendly and helpful from shuttle drivers to front desk clerks. The room is comfortable and very clean. There are a lot of restaurants around hotel area.from America, Mexican, Chinese, Greek, India, Vietnamese, Peruvian, Japanese...... . I booked via priceline because the rating was pretty high (I use express deals so don't know the exact hotel I'll be staying at. Like some of the other reviewers I was subject to noise because of other patrons who had their TVs up high, flushing toilets and conversations. The walls are paper thin. Also I had ants in my bathroom. I was exhausted and had already unpacked and so didn't wish to move. I was only there two nights. I could definitely see why they left ear plugs for guests. Free parking was nice, and the mexican resaturant next door is very handy and they are very friendly and food is pretty good. The hotel room that was given to me at best western South Bay had bed bugs. I was bit on my legs and my arm. This puts my health at risk since I was bit. The room window was cracked. The hotel was aware of that. This alarmed me because I rented the room for my 8 year old daughter and I. The room was unsanitary and unsafe. After seeing the bed bug I checked around the bed. I found blood stains on the mattress from the bed bugs. The room had mold growing every in the bathroom. The caulking was black due to the mold. The shower mat had mold stains on the bottom. I've never been to big chain hotel this disgusting before. That hotel clearly displayed that it was for the money rather than the people. My previous experience at best Western Dana point was amazing. I wasn't expecting this disappointment from a best western plus location. After alerting the front desk I was offered another room which I declined. I was then offered a refund. They told me it would take 1-2 business days to process. I agreed to the refund. The manager Keith johnson said he was in the phone with the merchant to get the funds pushed so I could have my refund back for the horrible experience I just had. The funds never popped up so the hotel agreed to give me a refund and pay for my stay at another best Western close by to the performing arts center my daughter was performing all week. I was able to stay at the redondo Beach best Western with no problems. This hotel was so clean! Night and day! After my stay there the refund still didnt process. I contacted mr johnson and he notified me that I wasn't getting the refund because they paid for the room at the other hotel. Which wasn't the agreement. I was lied to and tricked so I wouldn't call corporate and notify them or others about the issues I had. Dear Guest, Thank you for submitting a review on your recent stay at the Best Western Plus South Bay Hotel. We apologize for the experience you had and for the misunderstanding. We pride ourselves in giving superior customer service. We offered to send you to another property and pay for the room but somehow funds did not get credited to your account. For this we do apologize for any inconvenience this might have caused you. We called for a third party pest control company to check and inspect the room you stayed in for bed bugs and treat the room if needed. The in-depth report on the room they inspected resulted in a finding that was negative - there was no evidence of bed bugs. We also thank you for bringing up this matter to our attention. Perhaps you can give us another chance to extend our superior customer service. Best regards. So this hotel was a AAA selection recommended as a higher star rating. The room had a toilet running sound in the wall but nobody was flushing. Staff offered the room next door. Same thing flushing toilet sound in the wall. Management took 3 hours to come up with a plan. The staff were unable to articulate understanding of English language. They didn't have interest or time to solve or care about the noise. I was there as a nurse for a hospice patient who was doing of her bucket list items. The hotel experience part of this was awful and could have ruined her trip. Spent a night just to relax and the hotel is really convenient and clean. Nice beds and the breakfast was good and a lot of selection. Will recommend to friends and family. Friendly staff, easy check in and out. "Hotel is OKAY. But NOT close to airport"
The Hotel itself is fine, the Free shuttle there is around 30 mins without traffic. If you fly during LA rush hour or-and traffic issues it can take up to 2-3 hours to get to airport. AVIOD early morning or 3-7pm flights. We waited 1.5 hour at Airport for shuttle back to hotel. In Hotel's defense, its not the drivers fault, he was great! LA traffic is just horrible at times. I would not stay here again as a part of "Park and Fly" package" at a budget rate, there are many other hotels for the same price or a little more but way more convenient. "NOT BAD. . NOT GREAT. . BUT NOT BAD"
Rooms smell a bit musty but it is not over bearing. Room was quiet so we got a great night of sleep each night we were there. Breakfast is excellent with a wide variety of items. Great mom and pop Mexican restaurant next door. Staff is very friendly and quick to resolve any issues. We had a terrible experience. Not only was it 1-2 hours from anywhere with the traffic but the staff was not very accommodating. Also the key cards stop working every day and we had to go to the front desk every night to get new ones??? I left my cell phone behind and it has been A STRUGGLE to get it back. The language barriers have made it extremely difficult but also, it's like they had been holding it hostage. We are from Seattle and were almost to San Francisco when we realized we left it and they guy who answered didn't understand what we were saying and didn't help us so we asked to talk to a manager and the guy said they would call back. Finally when they called back, the manager says it's against policy to mail anything and that we have to physically come and pick it up. (we stayed at another BWP the next night and their manager said that that was BS). LUCKILY we had some coworkers in the area who went to go pick it up but when they tried to get it back, the guy had no idea what they were asking it it took THIRTY minutes for them to locate the phone. So I do NOT recommend this hotel. it is a shame to the BWP name. This has been the best hotel so far , in Jan I came to to LA after finding really cheap tickets on Delta, and subsequently did it again and again. The first time I stayed at the Baymont that is actually only 2 hotels down from BW after having a bad time the first time I should have changed hotels but didn't. :( . Best Western in California is good for the price honestly just to it being a little more upscale but different states different things since I'm from Florida. The staff was always sweet , the house keeping staff polite and although there are no microwaves in the room they offered to do it for me. There are multiple restaurants and stores but traffic is terrible well I guess normal for California. Loved the bed the laundry ,fitness center My issues were small ,noise fromthe room next to me, walls are thin, also a non pork meat item would be nice.So overall would stay at Best Western again. This hotel was a pleasant surprise. It was clean and very comfortable. Biggest plus was it's one of the very few hotels with free parking. Free breakfast was good, and convenient location to stores, food and shopping. Will Stay there again for sure. "Nice place to stay near LAX"
We did a park and fly and stayed at this hotel the night before our trip and the night we got back. Our rooms were clean, quiet, beds were comfy. The free breakfast was good. The free airport shuttle was a plus! I have been at this hotel for one night.i joined Take tours a Chinese tour company for 7 days West coast USA tour.hotel is good.room is very specious.near it you can find Indian food restaurant.hotel runs by Chinese team. "Perfect for a one night stay from LAX"
But room was clean, free breakfast was decent, location was good for me. I liked the liquid soap, shampoo, conditioner dispensers. They have me a complimentary shaving cream when I found out the one I brought fizzled out. It was a good price compared to anything else in area of short drive to LAX. "UNSAFE HOTEL, RUDE STAFF, THIS PLACE IS A DUMP"
DO NOT STAY HERE. THEY LEAVE THE BACK DOOR PROPPED OPEN UNTIL 10:00 AT NIGHT!!! Please do yourself a favor and do not stay at this hotel. I thought, we just need a place to sleep at night, not a luxury hotel, how bad can it be? Boy was I wrong. This place is a complete dump. The first room they sent us to smelled of smoke so bad we had to move. The elevator area reeked of marijuana, and there's a big sign outside telling people it is prohibited (the fact that they even need the sign tells you all you need to know). Here's the worst part - they leave the back door propped open until 10:00 PM (it's manager's policy...what??!??!). This door is by the pool, and they said visitors need to have access. There is a hotel card swipe available to open the door, but no, they can't shut the door because the visitors don't have those. WHY IS THE CONVENIENCE OF GUESTS' VISITORS MORE IMPORTANT THAN THE SAFETY OF THE PAYING GUESTS?!? This hotel is NOT in a good location, and with the state of the world today, there should not be doors wide open for anyone to walk into (despite the hotel telling me there was security on the grounds. We were outside several times - what security???) Trying to deal with the man at the front desk was a nightmare and resulted in nothing but frustration. DO. NOT. STAY. HERE. Dear fl0werp0wer2, Thank you for sending your feedback regarding your stay at the Best Western Plus South Bay Hotel. I appreciate your taking the time to write and hope you will accept my apologies for any inconvenience you experienced. I have researched on your comments and will take steps to ensure that the concerns you brought up will not recur. My staff will also be made aware of the issues and will all take immediate corrective action. We appreciate your patronage and hope you will stay with us at the Best Western Plus South Bay Hotel the next time you are in Lawndale, CA. I can assure you that we will do everything to make your stay an enjoyable and comfortable one. Sincerely, Noel Azurin Customer Care Best Western Plus South Bay Hotel. "Nice place - location good "
We stayed here because it seems every hotel was busy. This Best Western is an okay hotel. More Pros than Coms. Our room was clean and comfortable. The shower gel and shampoo rack in the bathrooms either need to go or they need to fix them where they work. I couldn't get enough shampoo or body was to even use it. I'm glad I brought my own stuff. The beds and pillows were comfortable. The pool is nice to ha e but small. When this hotel is busy it's hard to find a place by the pool. The hotel was very courteous and helped in any way they could. You can't wash after 10pm To noisy for residents. Breakfast was great. Location was great. "Lost Designer Sunglasses; Rude UNPROFESSIONAL Telephone Receptionist; Housekeeping Hung up on me!" We stayed here one night and the room was comfortable. However, I left my sunglasses in the room and immediately called. They found it and said they would leave it at the front desk for me. I called again and left a message for them to mail it to me at my expense. NO RESPONSE. I called again and the man who picked up the phone rudely said there were no sunglasses, as if I was lying. I told him that the last receptionist whom I spoke with handled it and left it at the front with my name. He didn't care and transferred me to housekeeping. The lady did not speak english, said a few words, and hung up. I called back again and explained to the SAME receptionist that housekeeping hung up on me. HE TRANSFERRED ME BACK AND SHE HUNG UP ON ME AGAIN! So I lost my designer sunglasses. I tried contacting their head office customer service. Terrible! Unprofessional! breakfast is hot, has a lot of breakfast, the place is clean and the lady who attends breakfast is really lovely and very kind. I definitely come back again..the location perfect really close at airport. "Last stop on the way to LAX"
Clean and tidy - looks like like a regular motel from the outside, but the rooms are top notch inside. Clean bed, towels, bath - we stayed in some fancy hotels in Vegas that could take lessons from this Best Western - got more than we payed for. "Very rude staffs and manager is lied he is not the manager." Receptions and Managers really rude. Dirty and breakfast is lousy is can be. Disgusting breakfast and they hide them frozen yogurt. When is asks they give you and we can't choose which flavor too. Weird. Don't book room there it's really not worth it!!!!!!! Horrible horrible place ever!!!!!!!. Elevator is drop all of sudden and make weird sounds. Scary!!!!. Price is to high for this hotel and can't be 3 star. "Ok WiFi, clean but a little run down"
I wanted somewhere close to LAX with free WiFi / parking/ breakfast and this fit the bill. Some reviews had me concerned but I found the free WiFi strong and fast, and no sign of pests. The room was clean and the bathroom looked mostly refreshed but there was black mold under the counter lip and water damage on the wall. No problems for us though. I never did get to try breakfast but the parking lot was large and easy access to the freeway reaffirmed my choice. Try the Fiesta Mariscos next door for a casual or takeout shrimp dish. Checkin was efficient and staffed at all hours. If you are shopping for a budget hotel (usually price is paramount) then Best Western would appear to be one of your better bets. Having stayed at all three Best Westerns around LAX, I would say that my experiences have been generally positive. In the case of the establishment in Lawndale, for reasons to boring to discuss, I recently found myself staying there on three separate occasions within a month's time. The result was anything but consistent. When it was good, it was very good. But when it was bad, it was disappointing. My first stay was by far the best. For reasons unknown, I was given a very large room, more of a genuine suite, with two large televisions, a separate seating area completel with kitchen sink. Located at the back of the building (the odd numbered rooms on the second floor) it provided a very comfortable overnight stay. The second time however I was provided with a room down the same corridor but on the even numbered side of the hall. The room was of standard size though much smaller than my previous one. The third visit was disappointing. The room was by the highway in the front of the building and of a size inbetween the two other rooms. But this time a call to me had trouble getting through because initially the front desk claimed I wasn't there and then connected my friend to the wrong room. But the real trouble hear was that a requested wake up call never came through. To me this is the worst fault of any airport hotel. It can mean missing a flight and being stranded. Fortunately I woke up on my own and was able to hustle and get to the airport on time. One major issue about staying at this establishment is its distance from the airport. Traffic can make the shuttle trip unhappily extended. If traffic is light the time is about 10-15 minutes. But in heavy traffic the time can be 25-30 minutes. My third stay I had to wait 30 minutes for the shuttle to arrive and then another 25 minutes for it to make it to the motel. So if you are going to use the shuttle make sure you phone as soon as you get your luggage if not before. Included breakfast is what you can expect at a budget hotel. The only oddity is the fascination here with mechanizing as many parts of the process as possible. The surrounding area is mostly nondescript with the usual fast food outlets and Starbucks in walking distance. This is what I got from 1/4--1/8/2018 while I stay in this hotel! And I was told by manager that they have no responsibility for this issue! On 1/6, I told them to change a room, after that, I had not gotten any biting. In this case, who has responsibility for this issue. Overall good experience. The park and fly option worked well for us. Timely trip to and from LAX. Main negative was that he WiFi was useless during our stay. The new included breakfast had a nice variety of items, although they are still working out some of the kinks as a few of the hot items were empty when we went to breakfast (8 am). "Great staff, lousy internet, noise, breakfast needs improvement "
Have stayed at BWPSB several times and unfortunately this place has the worst internet service I have ever encountered. Frequent drops, especially on the busy street side of the hotel; impossible to get on in lobby, in-hotel restaurant and rooms on the street side. Noisy with streetside traffic. Rest of hotel fine. Breakfast—waffle was good, juice watered down, eggs mushy, not much else to write home about. Quality needs to improve. On a bright side, all staff , including front-desk and housekeeping are extremely pleasant. Shuttle drivers give excellent service and very safe. Clean rooms. Pool is terrific. 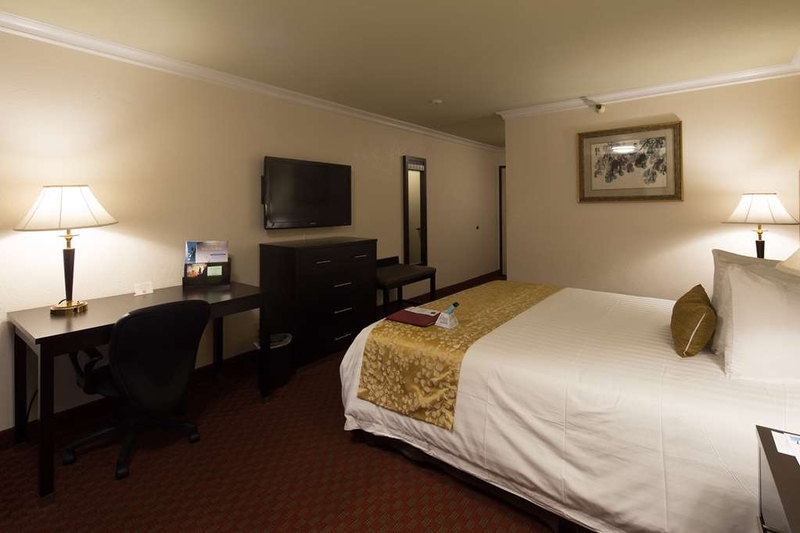 "NEAR LAX AIRPORT HOTEL WITH GOOD FACILITY"
This budget hotel is 7 miles from Los Angeles International Airport. The furnished rooms and with poor free WiFi, mini fridge, flat-screen TVs, and tea and coffeemakers. The hotel is very neat and clean mainly bathroom and toilet A laid-back restaurant serves American and international cuisine. It provides a free airport shuttle. Stayed at this hotel from 24/02/18 to 03/03/18 and found all to be very good, This was the second time I have stayed at the hotel and all as good as I remember, must firstly thank Noel Azurin for all his help regarding payment - one of the reasons I stay here is because the hotel allows payment over a number of months before my stay via my credit card so that when I check in the room is payed, as before room excellent, staff lovely and most helpful, restaurant excellent, jury out on new breakfast room as only opened in last two days of my stay, pool and hot tub excellent - all in all really, really good and will be returning. "Convenient if flying from LAX, otherwise I would stay elsewhere." Rooms have been refurbished nicely. Front desk staff was very friendly, better than some past stays here. Elevators were out, and lugging suitcases to 3rd floor(which were packed for a two and half week trip) was NOT fun. Desk staff helped and were apologetic. Not their fault. Rooms were clean. Breakfast is poor, with not friendly service. Bagged one to go is better than what is offered. Not on a par w/ other Best Westerns. Why do we return; convenience to LAX. "Not what I expected from Best Western Plus hotels"
This hotel is ok but the building is old. It is not up to par with other Best Western Plus hotel that I have stayed at. I am a Gold Elite club member and I wasn't given my choice of Bonus Points of Thank You gift upon arrival like at other Plus hotels. You can't get a doughnut or pastry of any kind unless you get seated at the in house restaurant. The coffee in the lobby was nasty and I could not get it to taste right with loads of sugar and creme. The walls are thin and you can hear noised from the other rooms very well. This hotel needs serious upgrading. "Fair but not up to the standards of BWP"
The place is comfortable, rooms have been refurnished quite recently but the hotel is old. Corridors need upgrade. Walls are paper thin. Very noisy. Wifi cuts constantly and breakfast is unacceptable. 4 choices of the same thing. Scrambled eggs, with hash, or sausage or etc. Looks like something you would get in prison. "It's close to everything "
Ok So what you been to one best Western you've basically been to all Best Westerns- so the bottom line is you chose to stay here because you're on a budget which is OK more money to play with :) The reason why I like this best Western is because it's conveniently located near the freeways. You have a Starbucks right next-door and a Wienerschnitzel down the street you have a really cool ice cream joint called rolling zone. Everything is on the Main Street of Hawthorne. There is a mall about 10 minutes away ( drive). If you want to go to the beach you would take Maureen all the way down about 15 to 20 minute drive. There is also a Walmart Trader Joe's and a fancy grocery store Bristol farms that is also nearby. "Great Staff and Close to Airport"
The staff at this hotel are outstanding. They make you feel welcome and are very helpful. The rooms have been renovated and are nice enough. The breakfast is not that great as the restaurant offers 4 choices of meals. No juice is offered and meal was served cold. It is close to the airport and we did not feel there was a security risk parking our car overnight. "Nice Hotel Excellent Staff, half hour drive to the beach"
I checked in to this hotel on the 1st of January for a 3 nights stay, which i had to cancel after 1 night. hotel is very clean and staff were extremly helpfull and polite, room was excellent and spacious, the pool and spa were very nice and clean. I had some minor issues with this hotel: The location which i thought it was close to the beach, it takes like a half hour drive if there is some traffic. the price was very reasonable. you can park your car free but there is a big sign that says "Park at your own risk" !! while other hotel offer security to their premises. Breakfast was included, but it was served at a chinese restaurant rented at the hotel, they offer you for choice of plates with very very small quantities, and when i asked for an orange juice and coffee, the lady almost screamed at me saying: "ONE DRINK ONLY" !!. the neighbourhood at night is not secure, so if you are looking for a nice stay and a clean hotel for a short period then i would recommend it, but return early at night! 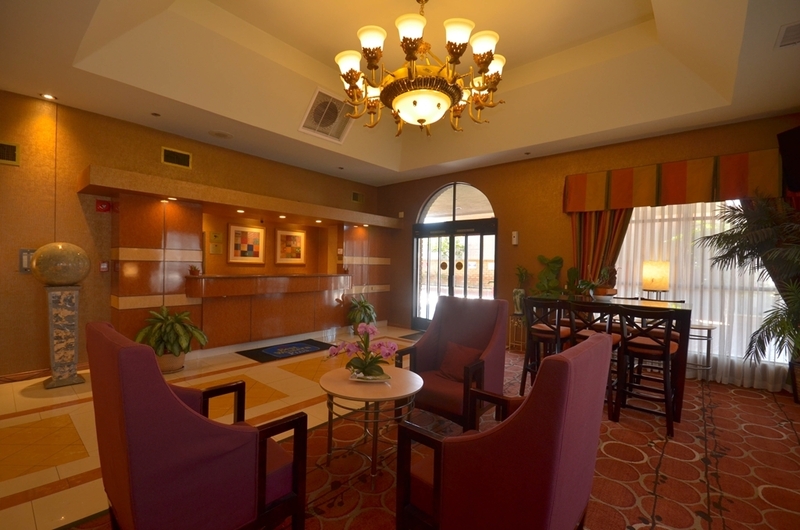 "Best Western south bay hotel"
Hotel Location is near LAX airport. If you drop here one night then fly back, the location is good. Beds are clean. sleep quality is good. Breakfast OK but restaurant is small. some tour stay here, taking breakfast feel crowed. Value for the hotel is Average. "Upper floor guests from HELL!!!!!!!!" Tracey was nice and helpful. Checking in was easy. Got room 205. When we got to the room the maintenance guy was fixing the door lock. Got a replacement room 202. It was fine and dandy till 3rd floor guess checked in. I was ok with dated room, the broken counter and broken tiles in the washroom. I'm not happy with the thin floors this hotels has. I can hear every steps the upstairs couple was doing. They were up and piecing around till 2 am. As they walk, the floor would crack and creek. Their shower was loud as f.$r.ack! Today Dec 20th 2017 at 1am. I asked front desk top put us into another room. He told me he doesn't have access to the system to put us into another room. (Wtf!). I guess we are stuck in hell. If you are unlucky to get a room below 3rd floor, you are f'ed. I think a good night sleep out weighs all the perks this hotel provides. I don't recommend staying here if you are a light sleeper. Thin walls and thin floors will ruin your night. Maybe you think you can just get up early and have breakfast. You might as well walk down the block and go to Macdonald's. Not comparable to other BW hotels that offer breakfast. I will not stay here again. I stayed here for 2 nights and I had some bitter experience especially during breakfast, TV and Jacuzzi. The room was pretty neat other than that rest everything were bad. Coming to breakfast, the restaurant people were very rude in serving, first I asked for a well toasted bread and all I got was a white bread sliced in two not toasted. Pancakes were rubber and spongy, served half a hash brown, when I asked for second serving of drink, the waitress refused to serve. This happened on both the days. The coffee machine next to receptionist was always out of coffee. Next TV, had a universal remote, which made life miserable because, we were not able to browse through the TV guide and know which channels to watch. and at last Jacuzzi, was very dirty and the water wasn't hot at all, it was just a lukewarm water. "very nice and would stay again"
"Great place to stay near airport"
I am a female and was traveling alone so I liked that this hotel had a free airport shuttle and a restaurant attached. I felt relatively safe in this neighborhood. The shuttle picked me up within 3 minutes of me calling the hotel. The staff was friendly and accommodating. The restaurant is convenient and the food was decent and decently priced. The lobby looks a bit dated but the room was updated and large and clean. Street outside was noisy and the AC was a bit noisy as well. From check-in to check-out, this was a hassle-free, relaxing stay. Even though the hotel is located on a pretty busy street, inside it was very quiet, They beds are SO comfortable AND they have the best pillows ever! Close to the airport which was important for us. Good location 10 min drive from the beach. Restaurant staff super nice but the check in people could be a bit more helpful and smile more often. Rooms ok.
"Kind of what you expect in Lawndale"
This BW is ok if you are just in need of a place to stay somewhat central to Long Beach and LA. Room is spare and a little suspect in cleanliness and security, no ambience, staff decent enough but it's in the middle of Los Angeles so don't expect gracious over-the-top courtesy. Free breakfast about what you expect from this kind of stay, edible but that's about it. Bed tolerable, noisy a/c, etc. Not a resort stay, but didn't expect one. "Hotel average, staff is great!" The hotel is a bit dated, rooms are clean, the breakfast is ok if you don't like to eat. Better off going somewhere else if your hungry! Good price for park and ride if your flying out, the staff makes up for all of hotel failures! Very friendly and helpful. This place is a hidden gem, centrally located right off the 405 and less then 10 min away to LAX. Used my points for a free room and Rick at the front desk graciously upgraded me to a suite ( as I'm a diamond member). Rick was also helpful with explaining the computer room printing of boarding passes(free for hotel guests) and throwing in a couple bottles of water to boot, this is customer service!!!! There is a great Vietnamese restaurant down the street called Saigon Dish that is dang good!!! Thank you BWSBH for and excellent stay!!!!! "one of my top three places." i can't say enough about this place. awesome staff-honestly. any chance that i'm out that way i do try to book here BUT they sell out so quickly. the rooms are nice, no wifi cut offs, OUT OF ALL THE PLACES I'VE EVER BEEN and i can promise you:i've been to cottages, hotels, inn's all over the world.....the best beds' ever hands down have been at this location. i'm really into the wifi connection, pillow sizes and bed feel, working signal for the tv AND QUIET ROOM. the sitting/meeting area is just as equally as important to me. awesome restaurant-you get a real breakfast here. My family and I stayed at this hotel for a week while we did a SoCal vacation. It is great. Centrally located and close to the beaches, Disneyland, Hollywood, and LAX. Was perfect location for visiting most of the major landmarks and vacay spots. Great staff and the restaurant in the lobby was a wonderful surprise. Very excellent service. I was not shown on reservation when it was check in time and they gave me the best service. Nice people good area to stay around close to LAX air port and can drive to different beaches. Will be looking into this hotel again! We had two stays at the Best Western Hotel South Bay. We even left our car there. They were very helpful! We will stay there again in the future. The restaurant is very good, and convenient. The shuttle driver is very helpful, and friendly. "GREAT CUSTOMER SERVICE AND FRIENDLY"
All the staff was so friendly and took great care of you. This hotel has a lot of great services such as a small gym, restaurant, computer room, and laundry room. They also have a shuttle van that takes you to the airport and picks you up. I recommend to take your family here or for business. The people here always treated my family with respect and the man that took us to the airport on a Best Western van was super talkative and made our trip even better. This hotel is the worst hotel we ever stayed in. It smells of dirt, breakfast was awful and in a bad location. The pool had green film in it and the photos on the website do not portray what the hotel truly looks like. Room was old and needs renovating!!! 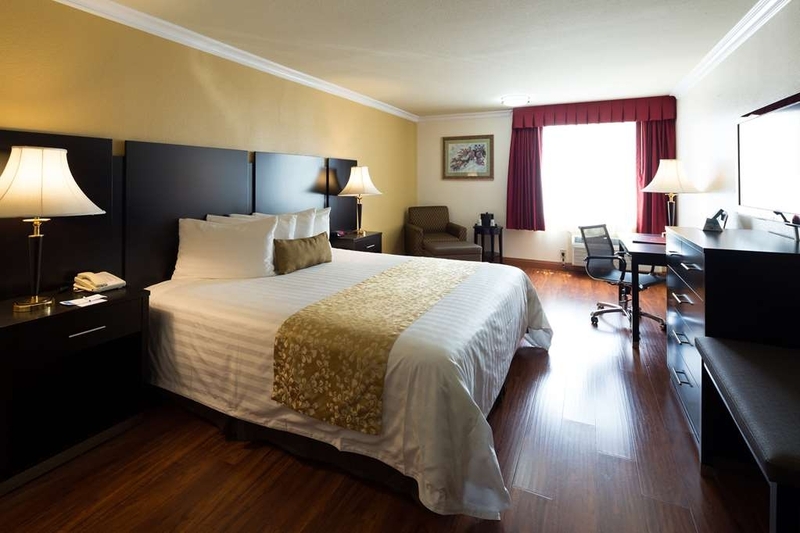 A Clean,comfortable older style hotel near the airport. The staff are helpful and friendly. We were flying out early the next day so the supplied breakfast to go plus a free shuttle 5am to the airport was very welcome. The shuttle was very professional and runs an hourly service. I wish we had known about the shuttle availability and booked it for our arrival. Probably through the hotel. Really nice comfortable beds. Spacious rooms. Good wifi. Staff are lovely and friendly. After that, it's a standard motel. Parking is plentiful so you shouldn't have problems getting a space. Nothing really around (other than some fast food places) but Uber's to most places are cheap so just find a place on trip advisor to go before heading out. The front desk staff were always warm and kind to me when I came by. I forgot to pack a toothbrush and was personally delivered one to my room in under 10 minutes. Appreciated the hospitality. In-room internet worked well, and the free breakfast was helpful for my group's budget. We stayed at Best Western in Lawndale on Hawthorn Blvd, though this hotel is dated, the rooms have been remodelled and it is a well kept and well maintained hotel. The staff are very friendly and check in was a quick and easy. The restaurant is very good value for money and the food is pretty good. This hotel is located in a safe area and you won't have an issue walking around during the day. There is a CVS Pharmacy pretty much across the road and there is an excellent supermarket not more then a 3 minute walk from the hotel. There is a Jack in the Box right across from the hotel. The room we stayed was very clean and the tv has about 30 channels to watch. The hotel has free WiFi and a free bus shuttle service to and from LAX Airport. All in all fantastic hotel with great value for money. I highly recommanded this hotel. "Great Deal, clean rooms and friendly staff.!!" All new furniture, extremely convenient locations. There is wonderful free breakfast and shuttle to LAX. I had a great time staying over in between business travels. There is a jacuzzi and swimming pool that I really enjoyed and the staff was extremely helpful and friendly. I definitely recommend staying at this best western. Great deal!! "Tired property, but good customer service"
We were running in late trying to find a place to stay near Los Angeles International Airport, coming from Disneyland. 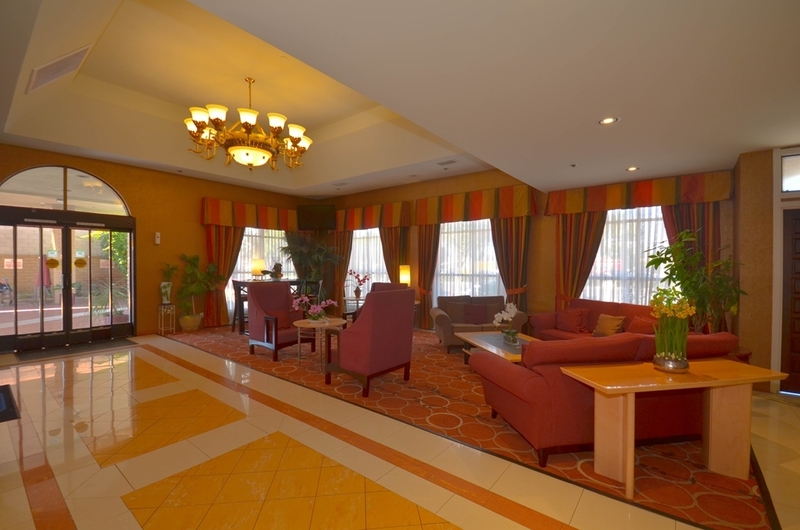 Plenty of free parking, complimentary lemon water and coffee in lobby. Hotel seems makeshift: while hotel staff are working on renovation projects, things aren't put away. Boxes in the hallways, low ceilings, you can hear yourself walk to your room, doors slam really hard, trip on door jams. Entire lobby and first floor smells like a Chinese restaurant. You can hear the power room of the elevator, you have to push the "up" button" to get down, and there's randomly discarded items (as if in the middle of DIY projects that have been postponed). Chinese restaurant is part of the hotel, but it seems only for hotel guests (I guess you can walk-in from the outside, but there is no public entrance for the restaurant). Chinese restaurant is where guests have free breakfast in the morning, selecting from 4 breakfast types. I think it was a good touch to offer a Chinese breakfast. Breakfast was okay (a little chewy on the pancakes). One meeting room and it appears to be "hobbyist" looking. Fitness "center" looks like an after thought. Property is okay (I would rate a 2.5), nice outdoor pool and whirlpool area (in parking lot), but owners seem to have a genuine care for guests. Great place to stay if you're travelling on a budget. The hotel represents excellent value for money and the staff and facilities were great. The location of the hotel is about 15 minutes from LAX but the surrounding area is not that great, not many bars or restaurants that are walkable but if you have a car then there are plenty within a 10 minute drive. The pool area is really nice and there is a chair lift by the pool and hot tub to help disabled guests to get into both. The hotel decor is a little "tired" but that doesn't take away the fact that it's a great value place to stay. Spent two nights and had everything I needed. The room was very clean, quiet and comfortable. Parking was free with easy access to the room. Great location convenient to airport, beach towns and restaurants. The cheap price isn't a deal, it really is a cheap motel. It does not deserve the Best Western Plus title. The shower grout was moldy. The room smelled dank. The air conditioner is on a senor, so when everyone in the room is asleep the a/c turns off until someone moves. One of the lamps in the room was broken. I had reserved a roll away bed. When I got there I was told I could not have a roll away bed. They said the room had a pull out sofa. The pull out sofa mattress was a two inch foam pad. Worst pull out couch ever!!!!! The second floor ice machine and vending machine was broken. The elevator closest to the lobby only worked occasionally. We asked for two extra pillows and were told they didn't have any extra pillows. The Continental breakfast was a choose from four choices on a menu breakfast. If you're a "I only want toast for breakfast kind of person you're out of luck; you have to get just what is on the menu. When we came back to our room the second night after being gone all day we found the cleaning staff had left our door ajar. Luckily no one went into the room and took our belongings. Honestly, pay a little more for a good hotel; this is not it!. The only reason I gave it two stars is because it has a parking lot. I loved the hospitality making me always feel comfortable. The manager(Keith) is always on staff to make sure everything runs smooth and he is also, very personal and friendly as well as the other staff. That is why I keep choosing the BW in Lawndale it is the only one that is like that..
place was clean and staff were helpful and friendly. Place was older but looked like it was being remodeled. The restaurant was amazing and 24 hours get the Cubian sandwich it was delicious. We would definitely stay there again especially for the restaurant. I was really impressed by the staff at the arrival. Kind and helpful. Not so quiet but the ear plug works. My big disappointment was in the plate ! Wow ! Breakfast efficient hi hi hi ! Not much in quantity and quick for another party ! Good value for price. Nice Pool/Spa.. Staff friendly and helpful. Metro nearby for easy access to downtown LA sites. Relatively quiet. Stayed there just before 4th of July. Bed firm and comfortable. Booked in advance of trip so got a good price. We stayed for a week as part of our honeymoon. After arriving we had to change room as the safety deposit box didn't work and had to try 4 other rooms till we found one that worked however this was dealt with very well by the reception desk. The breakfast was terrible and that put us off using the restaurant for dinner, however after 4 days we found we could upgrade the breakfast for a small cost and when we did try the restaurant for dinner it was very good. The hotel is good and it has a lovely pool and spa to unwind in after long days out. There is also a laundry room which is handy if you need to freshen up any clothes. The room we had was kept clean and well spacious. Parking was also easily accessible. We would recommend this hotel to anyone looking for a cheaper hotel than one in downtown or Hollywood area. It does take a little longer to get anywhere but the hotel is easily accessible from the highway. A lower end hotel esp for business travelers (might be average or a little better for vacation). Various problems during stay that affect business travelers. Very poor Internet connection in the room. The "computer room" was really only set up for surfing the Internet. The printer that was in there was not installed on the computers and could not be installed due to no drivers. The printer that was installed on the computers was accepting print jobs, but not physically present. One of the computers need the MS OS to be re-activated as it said it wasn't genuine. "Great hotel in LAX area." This is my home away from home. Excellent staff, clean comfortable rooms. In a very nice neighborhood. Great value for the price. Recommend it to anyone not looking to spend 3 or 4 hundred dollars a night. I asked the front desk to take the to go breakfast. He checked on the screen and then asked me to give him the proof which was green cards, otherwise, he could not give me the to go breakfast. I am pretty sure that when I checked in, the staff at the front desk did not give those to me. He kept saying that it showed the staff gave the proof to me based on what he saw on the screen. What's more, if we still want to have the food, we had to pay. I thought it was the front desk from last night's fault that he forgot to give the proof of having breakfast to me. What made me really mad was that the front desk who i talked to said that I was so RUDE!!! Exo me??? It was you guys' fault and I was asking for what I supposed to have. I will NOT RECOMMEND you to book this hotel. You paid a lot but the room and service are awful. "Great Budge Hotel, Comfortable Stay"
I stayed here for a couple nights on a business trip and had a good experience worth writing about. My room was tidy, clean, comfortable and quiet. Front desk employees were very kind and accommodating. Appreciated the computer room with printer and restaurant within the hotel so I didn't have to travel outside to eat before meetings. Lastly, the free shuttle service from LAX and back was great and another way to save money. All in all, great value and comfortable accommodations for the price I paid. My room was clean. The bed was comfortable. I had a perfect night's sleep. My room was very nice and quiet. The temperature was exactly what I wanted. The entire staff was very nice and accommodating. I will choose this hotel anytime I am in this area. Thank you. "Good first night hotel "
Just off the plane, good first night stay before moving on our travels. 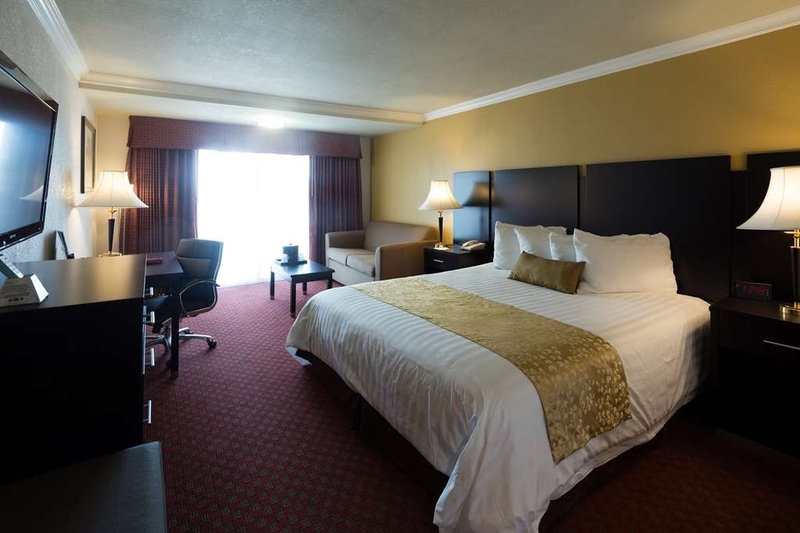 Clean, comfortable & spacious room, comfortable beds made for a good nights sleep. We used the hot tub before heading to bed, lovely & hot, the perfect thing before bed - the pool was icy cold. Breakfast was a little odd, you got given a menu & you could choose either picture A, B, C or D with tea, coffee or juice but edible. "Close to airport but that's about the only good thing! " I don't think I have ever given a hotel poor rating but I felt this one is well deserved. We arrived quite late at night for an early morning flight from LAX. The hotel is not too far from LAX and offers a free hourly shuttle, which is probably the only great feature of this property! The rooms are extremely outdated and the carpet in the hallway is quite dirty. The rooms reminded us of cheap and old motels which is exactly what this property is. We just felt uncomfortable staying there and would not have stayed more than a night of it wasn't for our flight early next morning. The breakfast was included but you get to choose from 4 options and the quantities were fairly small. When we wanted to book the shuttle for the airport, they didn't have one at that hour due to the fact that their shuttle takes guests to the cruise terminal. We were waiting to order the taxi when the manager decided to give us a lift to the airport since he had to pick other guests! That was really kind of him and was the best experience we had at this hotel. Unfortunately, it didn't do much to change our impression of the property itself and hence the poor rating! Close to shopping and food within driving distance. Affordable and clean just expect the WOW factor, noticed some clutter do to renovation but not bad, pool decks had numerous bird droppings. The free breakfast was good however you were limited to 4 plate combos, I did read later that you could upgrade for an additional $4.30. Overall it was a good stay for the $, not sure if I would return. Oh and the staff were amazing. Best hotel I've stayed at in lax area in this price range. Friendly and helpful staff. I'm happy to be there. Not hoping the night hurries up to be over. I rest well because it is quiet and clean and decor is relaxing and inviting. My new home away from home! Location was good, 15 minutes from LAX. Very friendly and helpful staff. The on-site restaurant was very good and provides an excellent included breakfast. Facilities are tired and the property could use some investment by the owner. The sink in our room leaked from the u joint and the in room safe had no power. The carpet are long overdue a shampoo. After walking bare foot to the shower we left black foot marks in the tub. "Not a true "PLUS" Best Western"
I chose this Best Western because I like its location and shuttle service to LAX airport. There's a Jack in the Box, Panda Express, a bakery and supermarket all within walking distance surrounding this hotel. We ate at Panda Express and thought we would reheat the left overs for lunch the next day when we realized there was no microwave!! All "PLUS" Best Westerns usually have a refrigerator and microwave, but not this one! Breakfast is also a little different. Rather than the usual buffet arrangement, you're given a set choice of 4 different breakfast selection that's rather "minimal." Small pancake, two sausage links, about a single scrambled egg and a small cup of fruit. You also get a small coffee or juice. The other 2 choices are slight variations of this except one Asian type breakfast. The hotel is nice as all Best Westerns are, but this one is just slightly less. I would stay again when traveling. 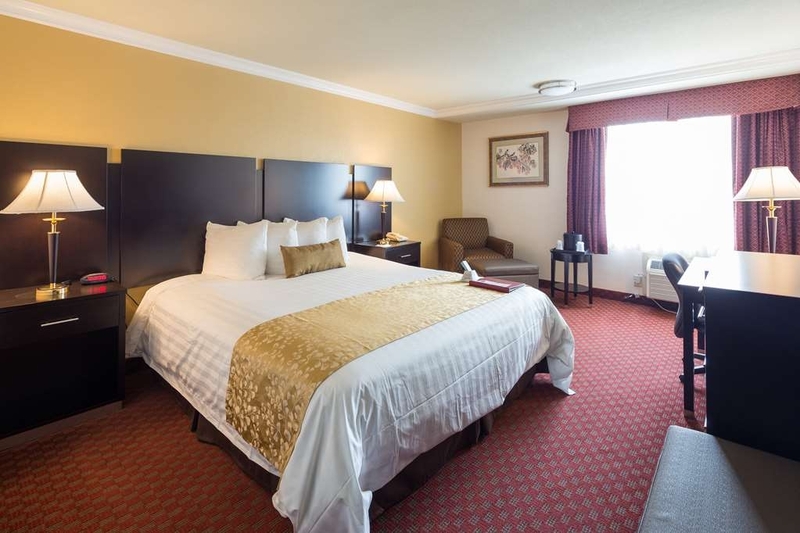 "The staff is the only reason this hotel passed"
The staff was friendly and helpful. It would have been more comfortable sleeping on a concrete pad, breakfast was less than appetizing (green eggs and ham brought to real life) and the green pool and hot tub ensured we stayed far away from the pool area. This Hotel is an Awesome place to stay! Accommodations is great, staff is friendly and helpful. The rooms are clean, spacious and comfortable. You feel very safe and secure staying here at the BEST WESTERN PLUS!! "VERY COMFORTABLE HOTEL CLOSE TO LAX"
I picked this hotel to be close to LAX for my flight home. The hotel is right on a main route to LAX, but far enough away to avoid aircraft noise. It had ample parking, and the exterior area was clean. My room was clean, comfortable and quiet. The front desk was pleasant and speedy with their service. The Internet was very good, and there were enough outlets available to recharge everything that I had. The breakfast was different, as guests select from 4 options on a menu. It was served rapidly and was fine. I would have no problem staying here again. Very nice hotel near LAX. Good neighborhood with many choices of restaurants. Staff very nice. CVS Drug store across street, supermarket nearby. Hotel room very comfortable and clean. Pre set breakfast very fast and tasty. "Safe, clean hotel with a complimentary breakfast"
We stayed in this hotel for almost a week during our move to LA. 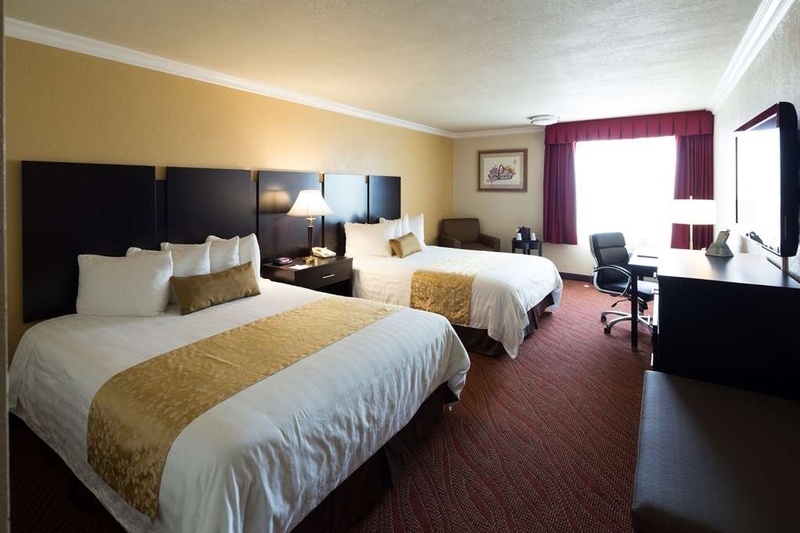 This hotel can be easily accessed from freeway and is located in a safe neighborhood with a well-lit parking lot. The rooms are spacious, very clean and at the moment, they're doing some renovations and are replacing the carpets so it will be even better. They have complimentary breakfast with 4 choices and unlimited coffee/tea/juice refills. The staff is outstanding, you will feel very welcomed in there. They have coffee in the lobby, laundry room, business center, and gym available. Many stores and restaurants in a walking distance. I would highly recommend staying with them if you're looking for affordable hotel in LA. If ever I need a hotel in Los Angeles this is where I plan to stay. You must call for the shuttle to pick you up from the airport, but it is so worth the wait. Once you get on to their shuttle, it's all good. The drivers are great, the hotel staff is great. Hotel is clean and the location is excellent. You can eat in or walk to the restaurants, CVS, fast foods, take a bus to the mall. Safe area. 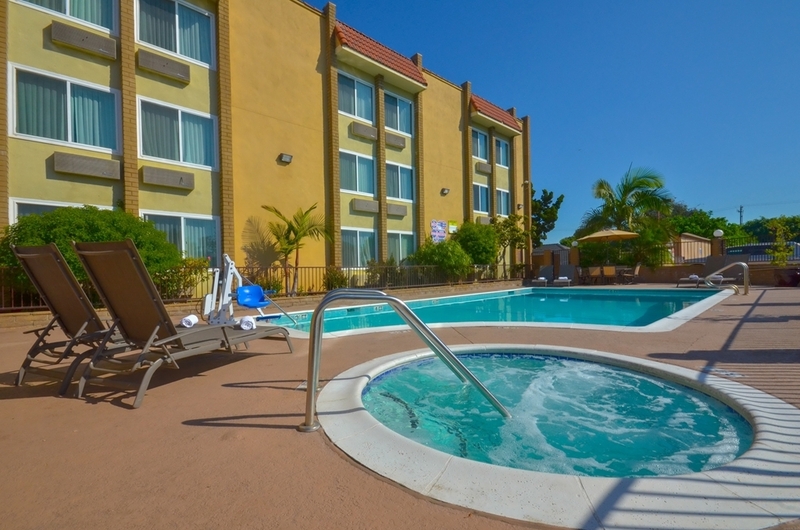 Best Western Plus South Bay Hotel in Lawndale is a nice hotel to stay and a good location to LA International Airport, beaches and tourist attractions such as DisneyLand, Universal Studio, Hollywood and Downtown LA. The staff here are very friendly and helpful, especially Rick and Keith in front desk. My room is supper clean. The lobby is pretty, get a nice pool and spa, very large room and so comfortable bed and bed set - wonderful pillows. Restaurant has good food-many styles : American, International and Mexican. The location is great as it is near the airport. I was however quite disappointed with the room the moment we entered. The toilet seat has chipped edges and it looks dirty to me. Water is leaking at the bottom of the sink after using. The bathroom floor becomes wet and floor mat is soaked. Stayed here for 3 nights and had to endure with this. "I'd stay there again! :)"
This wasn't a bad spot. It was just me and my 2 teenagers. The Jacuzzi was a lil "yellow" but we went in anyways! after a long day walking around Universal studios we needed it. we never ate there so I can't comment on that. Overall, it wasn't bad, the neighborhood was ok....there is a Starbucks right next door. "Convenient to LAX, clean and comfortable"
Look. This isn't supposed to be the Waldorf. And honestly, I was pleasantly surprised by how clean and friendly staff were - stayed to be close-ish to LAX and it was perfect for that. Sheets were clean, rooms were quiet, and it was super close to the highway. Totally recommend for anyone that needs an LA-area hotel to stay at. Nice & clean rooms, very comfortable king size bed but we could hear our neighbor snoring which didn't bother us too much since my husband & I both snore. Good thing I always travel with my own soap, shampoo & hair conditioner because dispensers did not work properly. Enjoyed the hotel's restaurant very much. Food & prices were great and parking was free. "Perfect Airport Shuttle, good value"
We stayed for One Night After arriving At LAX and The Shuttle Service Worked well. The Room was clean and spaceous. The Furniture was a Bit Dated But okay. Staff was very Friendly. Breakfast was Limited But acceptable. Would Return. I enjoyed my stay here, the staff was very polite, the rooms were clean; loved the bed. Really enjoyed my time here. Didn't particularity like the breakfast but it was free, LOL! But there is a Jack in the Box across the street... I appreciated the fact that they had free shuttle service from the airport to the hotel, this was another great service. I wish there were microwaves in the room and I really loved the free parking. If I am ever back in this area, I will stay at this Best Western again! "Great value when you're a BW rewards member"
We were very happy with the value we received and the service and cleanliness of this hotel. Definitely a good place to stay around LAX but not too close so you can hear the noise. The room was large and although the decor wasn't spectacular the room was comfy and clean. Well done! We stayed at this hotel twice as a stopover for an international trip. The accommodations are acceptable, and the location is quiet. The big negative is the airport shuttle. We had to wait a long time to be picked up at the airport. The second time, our wait was 1 1/2 hours. We called the hotel multiple times and still had a long wait. The breakfast was served at a little cafe and you ordered from a set menu. It was just ok. We would not stay at this hotel again because of the shuttle service. "Easy Access for Business Appointments"
A clean affordable place to stay for business trip. Busy street and at night can be loud at times. Room is kept clean, Reasonable food, and prices in the attached restaurant. Served simple breakfast in the morning included. Friendly service. Opened the Gym for us early. Will be booking here again. great little hotel. people treat you good especially in the restaurant area! There are a lot of international travelers that stay here however. plenty of parking and pretty close to all the attractions you probably want to go and see. "A good overnight stay except for the booking confusion." We chose this hotel as a transition stop from Taiwan to Kansas because its price was more acceptable compared with most hotels closer to LAX which provided free airport shuttle. When we arrived at LAX we were not sure if we needed to call the hotel for shuttle, but after a short wait we saw one coming, so we showed the driver our booking confirmation and he agreed to take us to the hotel after phoning the hotel. Surprisingly after we got to the hotel the man behind the counter said he could not find our booking record. After some queries to his colleague in the office and a lot searches he finally found our record, but then he insisted that we haven't paid. I had to log into my bank on site and show him the electronic bill deduction record. It took about half an hour to resolve the confusion. That's not a good feeling right after 12 hours of flight. Except for the initial unhappy experience the rest of the stay is pretty good. There is a Mexican food restaurant just beside the hotel which opened our appetite after the long flight. There is also a supermarket across the road where we shopped for things to be used later. Even it was close to 9 PM the neighborhood felt safe to us. In the morning the breakfast was better than what we expected. It was hot meal served to your table. Although the menu is kind of fixed, the food was like something you would have in an average restaurant. Our room was clean and the wifi worked well. For the price we paid there is not much to complain. A nice hotel, with good family rooms. The rooms are equipped with a refregerator. The hotel has many facilities like a computer room (good for checking-in flights), a Gym, a nice clean laundry room, a pretty big swimming pool and free coffee and cold water at the lobby. The hotel also offers shutle service to the airport. at the hotel surrounding there are many hamburger chains. Great hotel and staff, appreciated all their help. I would stay there again the next time I need a hotel with parking. Thanks for all your help and understanding. I would highly recommend this hotel it was priced right and offered everything we needed. Clean and quiet. Staff nice and friendly from desk to cleaning staff. Did not try the free breakfast available or the restaurant but it's all there if you want/need it. Two minor problems. Two-speed hair dryer only operated at low speed so took twice as long to try my hair as usual. During showers, if a person in, probably, the room next door, used their water in some way, My hot water went cool. Overall enjoyed my stay. "Good prices, Lots of upgrades recently." I've stayed here quite a few times over the past few years and it is better now than ever. I'm surprised to see so many mediocre reviews. Somebody has put a lot of money into remodeling pretty much everything here. The parking lot, the landscaping, the lighting have all been redone. The pool is nice, great parking, two elevators, two pc's with printers, great WiFi, along with the usual Best Western room amenities. 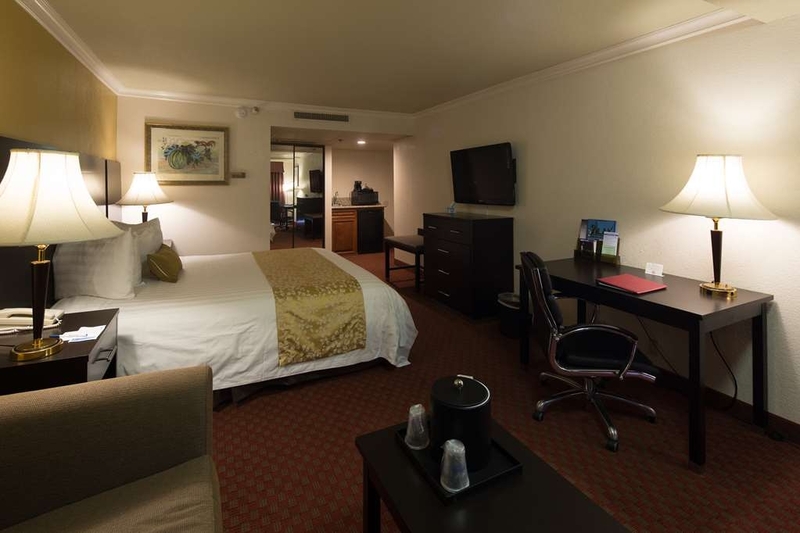 The business traveler will be right at home here. Fifteen minutes to LAX by shuttle. The old (terrible) Chineese Restaurant attached to the lobby is long gone and the restaurant that has replaced it (I don't recall the name) is pretty darn good. Also, they'll bring your food to your room! The breakfast buffet is gone too, replaced with tables waited on by the restaurant staff. You get a poker chip when you check in that serves as a token for breakfast.The breakfast menu is a bit limited, but it's been my experience that the waitstaff will happily get you whatever you want (e.g., 2 pancakes & 2 saussage, with a milk and a coffee). They've never made me feel like its a problem. Keep in mind, the restaurant and the hotel are totally SEPARATE businesses so be preparred to pay the restaurant for your food (other than the breakfast). "Doesn't do the name justice"
Being a loyal BW customer you come the expect a certain level of quality. Not at this property. The internet is a joke and even worse is their breakfast.. a choice off pictured menu: example one pancake, 2 sausages and bad fruit. Most BW's offer make your own waffles, toast, bagels, scrambled eggs, side of meat, yogurt and more. The depend on tourist bus companies as part of their customer base...not a place for a business traveler or family with younger children. "Affordable location not far from LAX"
Anything at or close to LAX was too expensive, at least at the time we enquired. So the Best Western at Lawndale filled the bill. A neat, clean property with a restaurant in-house gave us what we wanted. Off-street parking, clean comfortable room at a reasonable price. Pool and spa. Easy to find and a convenient run to LAX, 20 minutes - depending on the traffic. We arrived trashed from a flight across the Pacific and we were given early check-in with no fuss nor charge. We'd stay there again. Very poor service at check out on front desk. Service at restaurant was very poor too front an Asian lady. Nothing more to comment, also ice machines were empties. we spent some times in Williams Arizona a while ago and it was a very different experience. Called from airport and they claimed they did not have a reservation for me. When I persisted, they found it. Then took nearly 40 minutes for van to pick me up. The room I was initially assigned was not made up and I was then given another after a delay. The room and bathroom were OK. Overall the hotel had a worn and shabby look about it. Because my flight was early, I was given a grab and go breakfast. The hardboiled egg wasn't and the yogurt was beyond its expiration date. Hello, Thank you for taking your time to give us your feedback. I sincerely apologize for the inconvenience you experienced with our hotel. LAX is currently undergoing renovations, and there is quite a bit of traffic that is out of our control. We understand that the wait for the shuttle can be very frustrating. We are very sorry to hear that our breakfast did not meet your expectations, and I will double-check with our on-site restaurant the condition of our yogurts. Thank you again for your feedback. The decor is a little dated but so easy to overlook considering the price is so very reasonable, the very high level of service and the full, restaurant served hot breakfast. Remarkably good internet service -- roughly 10mbps up and down on the in room ethernet -- and excellent shuttle service people who went above and beyond! Very bad breakfast. Do not call your brekfast continental delux. You can choose between four different meals. Very small portions of food. You can only choose either coffee, the or juice (it is not juice, maybe you can call it orange water with sugar). The room is not quite, you can here all your neighbors talking in there rooms. Hello Tommy, Thank you for your feedback. We are very sorry to hear that our breakfast did not meet your expectations. We are currently exploring new ways to enhance the breakfast experience of our guests, so we thank you for your patience. 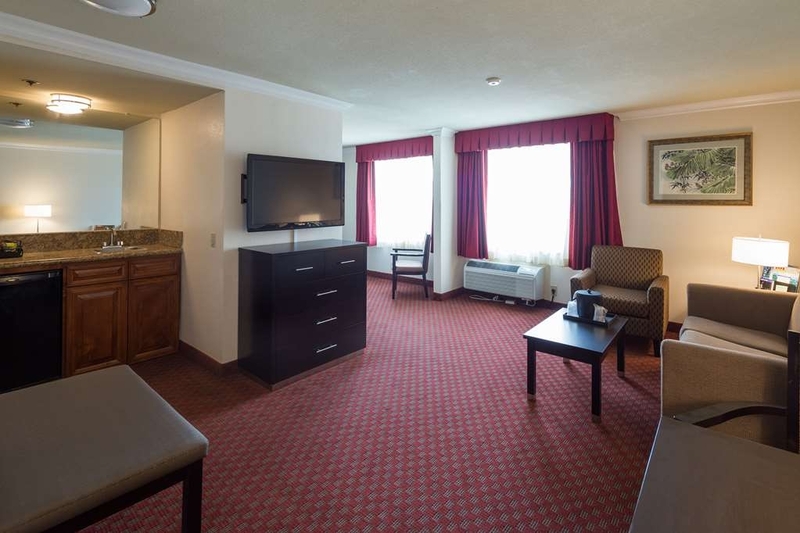 We will also be remodeling our rooms, and updating the furniture by the end of this year. We hope you will keep us in mind next time you visit the LAX area, and give us another chance after our improvements! Thank you again for your feedback. I visited this hotel only for 1 night and I found it pretty much average. It was like a layover at the hotel as I was with a tour. They had nice big rooms and wifi too. They also provided me with free breakfast. The only problem I had with my stay in the hotel was that in the room there was a constant beeping sound which did not let me sleep almost for the full night. I had to leave very early so didn't experience very much of the hotel. Hello Mohsin, Thank you for your feedback. I sincerely apologize for the beeping sound you experienced during your stay with us. Please contact our guest services next time, and we will be happy to resolve this issue for you. We take the quality of our guests' rest very seriously here at Best Western South Bay Hotel. We are happy to hear you enjoyed our rooms and wifi. We hope you will visit us again soon! Thank you again for taking the time to write us your feedback. I'm not quite sure how I'm going to write this hotel. The rate was fair about $112. Per night. When you go in to the lobby it has a restaurant which is a 24 hour Chinese restaurant. You're given a token for breakfast in that restaurant in the morning. So I go upstairs to my room. I find first off the refrigerator doesn't work. Then I go to get ice. The ice machine has pink bacteria growing in the shoot where you get your ice. Great. Back at the room there have been some upgrades to the room since it was built. All the lights are on motion sensors. If you have a room on the front Street it's very noisy up until about 9 o'clock. It stays quiet though from about nine till right around 7:15 in the morning when it sounds like everyone wakes up and takes off again. The hotel is dated I choose not to spend a second night there. Now the staff t is very good. The maids were very helpful the front desk was helpful .There is a great Mexican grocery right around the corner that makes great burritos for dinner very inexpensive. The hotel is doing upgrades like the parking lot when I was there. But I just can't get over the ice machine with the bacteria. That kind of did it for me. Hello, Thank you for your feedback. I would like to apologize for the condition of the ice machine, and I have made the housekeeping staff aware of this issue, and we will make sure this will not happen again. Thank you again for bringing this issue to our attention. The staff at Best Western Plus South Bay take pride in keeping our facilities clean and in good condition, and we value your feedback. For the non-working refrigerator, we have been made aware of the issue and have replaced it with a new refrigerator. Thank you again for your valuable feedback and we hope you will give us another chance to provide you with excellent service! "Just ok to spend the night"
Its proximity to the Intl Airport and its price are the only two redeeming factors. Rooms are spacious but they don't smell too good. Breakfast menu is fixed and thus not much to choose from. A one dollar shop just across the road gives good value for money. Hello, Thank you for your feedback! We are currently exploring other options to enhance our guests' breakfast experience. We will also do our best to improve the smell of our rooms. Here at Best Western Plus South Bay Hotel, we pride ourselves on being able to meet the expectations of our guests. I hope you give us a chance to resolve these issues you have brought up, and come visit us again! Again, thank you for taking the time to give us feedback. They have management issues. The manager at the reception desk was extremely unfriendly. The bathroom cosmetics were inferior quality. On the other hand: The hotel is conveniently located near the LAX Airport & the hotel has a convenient shuttle service. The size of the room was good. The complimentary breakfasts were satisfying, we were served at our table promptly. Hello, Thank you for your feedback! We are sorry to hear your stay with us did not meet expectations. We are not sure what happened that day, but our front desk managers are usually very helpful and friendly. I will bring this feedback up with the front desk to make sure they are always aware of the impressions they leave our guests with. Regarding the bathroom amenities, we will be switching bathroom amenities soon! We are very excited for the change. We are upgrading to eco-friendly dispensers with premium product. Here at Best Western Plus South Bay, we are looking for new ways to be sustainable and reduce our plastic waste. 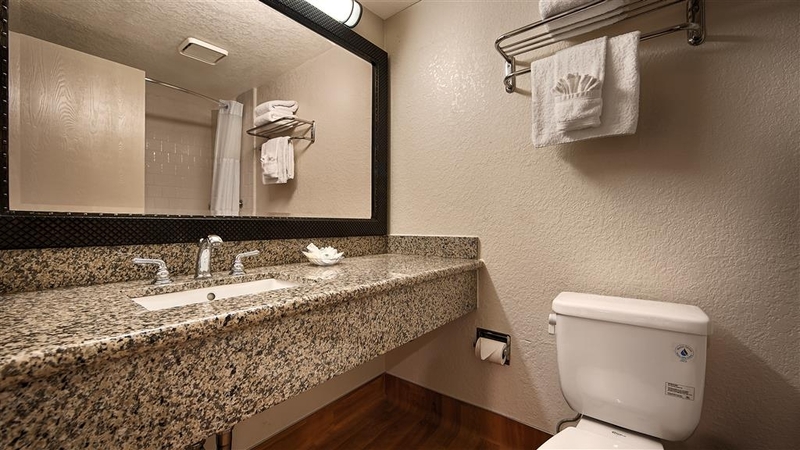 Not only will we be updating our bathroom amenities, but our rooms will be getting a modern makeover soon too! We hope you will give us another chance and visit us after we have all our new updates in place. Thank you again for your feedback! The hotel provide quite good service, such as airport pick up / drop off, internet and luggage deposit, with reasonable price. The advantage of this hotel is it is quite close to airport and it provides pick up / drop off service. "Old hotel that needs heavy reconstruction"
Friendly staff is an added value to this old hotel that calls for reconstruction. Although breakfast is included the choice is very limited and basically we needed to eat outside. hotel has its own parking, small hall and big rooms. Hello, Thank you for your feedback. Here at Best Western Plus South Bay, we are always looking for ways to update and improve the property. We are currently working on refreshing the look of the hotel's exterior, starting with a brand-new concrete lot which will be completed next week. 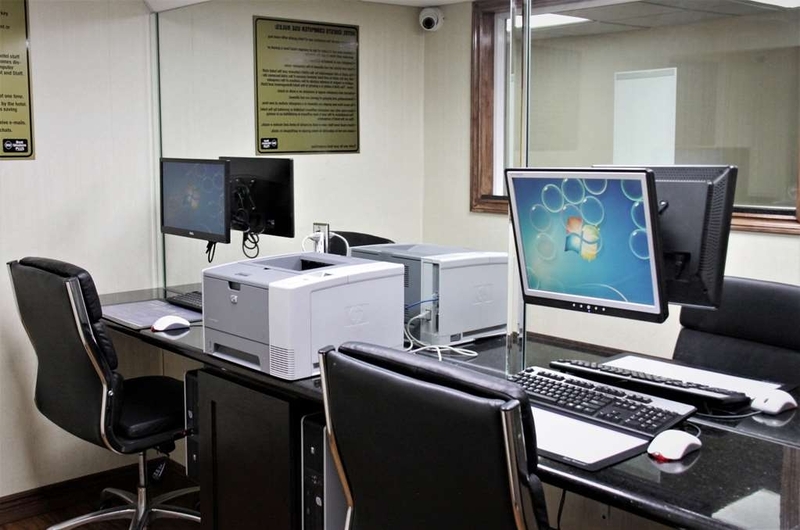 Since the beginning of this year, we have also added a new computer center for our guests. Later this year we plan to re-furnish the rooms with new, modern furniture. We will also be adding additional electrical outlets to our rooms! We are very excited for all our upcoming updates, and we are proud of our current updates. As for breakfast, we are sorry to hear that our breakfast of egg, fruit, toast and sausage has disappointed you. We are currently seeking other ways to enhance our guests' breakfast experience. 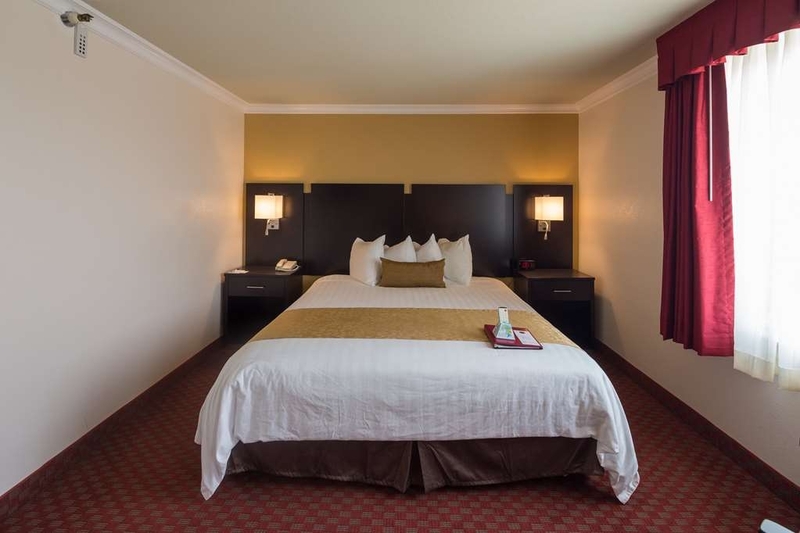 We hope that you can come by when Best Western Plus South Bay has completed its makeover and give us another chance! Thank you again for your review. Two weeks on the road with visiting family from Europe, this hotel looked like a good, clean one near LAX for our guests. Well, it was that but little else. It began with work trucks for some renovation in the parking lot. Bad pavement and trucks blocking parking ease. Then inside the office doors tiles being replaced on the floor had the middle area blocked so it was difficult not to step in the area cordoned off. Off to our rooms. They were nondescript, but clean enough. The hallway was noisy and had children running on the second floor. Being hungry, we went to the attached café to eat. Now this was the really poor place! A young man seated us, and took our orders. He disappeared for nearly half an hour and we were the only people in the place! Finally he brought our food and he got one of our guests order wrong. So back he want to get the correct order while she sat for 20 minutes and we ate. Appalling. The food was adequate but NOT good. We had booked a Hop On and Off bus tour and asked at the desk where we could park to get on it to start our tour. We were told there was parking at a local hotel which there was most certainly NOT. So we had driven around looking for this place for another half hour just to find we couldn't park there anyway. We had booked this hotel for 2 nights so we got up the next morning to have our "free" breakfast in the café. It was full of people so we found a table and sat. We watched the gal behind the counter take the glasses from juice and milk and rinse them out, set them on a towel and refill them for customers. Clean? Not too sure about that! Our meal was again, adequate but it was free so you can't complain too much. The next day when going for our breakfast a staff member came back into the café and yelled at the guy who worked there (over the volume of his lousy music) and made quite a scene. The only people at the whole place who were worthwhile was the cleaning gals. They were courteous and helpful. I wouldn't stay at this Best Western again if I had to walk to LAX. Don't bother. This was the 1st hotel of our tour group. There were a lot of restaurants nearby. There were also convenient stores. The room was big enough. We were not aware though that they had a shuttle to and from the airport. The bathroom was clean and big as well. Great hotel near Airport. It is in a neighborhood with restaurants and shops within walking distance. Not as expensive as the hotels on Century Blvd. The staff is very nice. I stay here about 2 or 3 nights per month. "Close to airport and restaurants"
Good pick for a less expensive stay for an early morning flight from LAX. We left before breakfast at 6:30, but it looked like the full deal as it's served from the hotel restaurant. Staff was very friendly and accommodating, easily moving us from the front to a quieter room in the back of the hotel as requested. Room was clean and everything worked. The internet was slower than we wanted, but it worked! Shuttle driver to the airport was very friendly, even offering to take us to drop off our car at the airport the night before our flight, bring us back to the hotel and back to the airport the next morning. Service with a smile! And a good night sleep. "Friendly, efficient staff - poor breakfast"
The front desk staff was very helpful and efficient. The rooms satisfactory, very low water level in toilet and it took ages for the tank to refill. Overall, the inside of the rooms, lobby and decor was beginning to look shabby. The breakfast almost unedible. The lobby needed dusting and vaccuming. "If your plans could change DON'T Stay Here"
We finished the meeting early and got an direct flight out that day and the hotel refused to cancel our reservation. The hotel staff bounced me to Corporate and the 800-number bounced me back to the hotel. Everyone refused to accommodate the travel plan changes. "Not worth a "Plus" rating..."
Unfortunately, this Best Western did not live up to its "plus" rating. I've stayed at other BW's with plus ratings, and they had beds, decor, lighting and breakfasts. This Best Western's breakfast was mediocre and the quality of the food was poor. Although the restaurant staff was very nice! There was not much attention to detail in the workmanship of the rooms. (peeling paint, bad painting and molding) The carpet seemed dirty and the room was dark. It was a little overpriced for the quality. I would stay here again! The staff was very helpful and friendly. The breakfast was just ok, not a lot of options. The beds were very comfortable, and the bedding was super nice! My kids slept like babies! Just needed a place to crash on a layover at LAX. All the props go to the shuttle drivers - they were both great! The hotel itself is fine - super clean and basic. It's the only hotel that I've never had to show ID or put down a credit card. Difficult to find a parking space, Food quality was VERY poor. Buy donuts or eat out is my recommendation. This is the only hotel in the world where there was only one small bar of soap for use in sink and shower. There is a difference in running a hotel economically and CHEAP. Toilet didn't work good, poor wifi the whole time. The manager was very helpful but couldn't fix the bad wifi or replace the faullty toilet. Not a good breakfast, take away breakfast, the egg was bad! The breakfast in the dining room was meager. Not up to Best Western standards of a breakfast. The area is great. Plenty of shopping and restaurants. Hotel is very safe. I would not stay again, because the rooms are just too noisy. Very thin walls. I could hear all my neighbors tvs and talking, as well as the folks upstairs walking, but sounded like stomping. And worse of all, the sound from pipes is horrible. You could hear when your neighbors shower. Could not sleep well with all these noises. Would not ever stay again. "very helpful staff and got my backpack in time"
Last Saturday, I stayed one night in this hotel. but when I checked out I forgot to take my backpack with laptop. I called back after I returned home (500 mile away). The staff helped me locate the backpack the mail back to me overnight. I was extremely glad I can receive my backpack in time (in fact, laptop is for my work and I was extremely concerned). I really appreciated the fantastic service and care the staff provided to their customer. I definitely will stay again and I will highly recommend to my friend. thank you very much. "I was offered a rate better than my AAA discount!" The desk clerk made my weekend! He had only two rooms left for the evening and he gave My Wife and I a deluxe King room for $100 Tax included! The room was exceptionally clean and they served a free eggs and bacon Breakfast in the Morning. We had a coffee maker, a mini fridge and even a large 47 inch flat screen TV! with cable. Nice!!! This stay was a bit disappointing as we expected more from a Best Western Plus location. The room was OK, but the quality was not what we expected. I was glad to see the recumbent bike in the exercise room as my wife recently had a replacement knee surgery and this was most beneficial. Chose this because it was close to LAX and offered free shuttle and a swimming pool .Also it was on the list of hotels that was part of the pick up route for my tour but not drop off. For me the convenience and other reviews about it made the decision. I had a single king bed which was comfortable and there was the pool. But I arrived late due to delays and didn't get to enjoy the pool. Nor the free breakfast as I had to leave very early the next morning. Overall a good stay. Great place to lay your head and sleep. They have always been friendly and pleasant. Noel is the best (thanks man!) if you need anything. Many places nearby to eat or shop. Parking is good and they are easy to find. Breakfast is provided (seated and served) in the restaurant attached to the property. There's also coffee in the lobby for those of us who prefer a fast getaway in the morning with our cup-o-joe. This is my Go-To location anytime I am in the area. Great value, great service, and the breakfast is really good. Well balanced, healthy, filling, great service. If you have a car and are looking for a reasonable, comfortable, good hotel in the LAX area, this would be a really good choice. We had a layover in LA - connecting flight so we stayed here. All was nice..very friendly staff, good location, everything was great..but wish had more choices for breakfast.There was a card with 4 choices and one had to pick one of them..not ideal..
"Great Value close to LAX"
Very nice hotel in a Los Angeles neighborhood, good restaurants nearby. Friendly staff. Good value for your money. I have stayed there many times in the past year and always find the hotel to be clean, staff helpful and pleasant. Can walk to restaurants and there is a major drug store across the street if you forgot something while packing. We had noo internet service with my new Apple laptop, tried for over an hour and yet at other Best Westerns we stayed at during the week we had no problems. Never did get it up and running. The breakfast is in a Chinese restaurant and it is not buffet and you get only 4 choices of very cold supposed to be hot items. Milk is served in a coffee cup not a glass. Weird. "Great price with a few extras"
We needed a place convenient to the airport, city and beaches, the location is great for this. Pros - pool gets all day sun, there's a hot tub, which is nice because the pool isn't heated and it's freezing. The shuttle driver is so sweet, he even took us to the car rental place, which was out of his way. The breakfast server was a sweetheart, so attentive and friendly. Free shuttle, Free parking, Free breakfast, nice comfy beds, updated bedding, clean. Cons - paper thin walls, i could hear my neighbours coughing and chatting.. at 5am! i could hear people walking above me. I prefer the usual buffet breakfasts over these 4 a la carte options; but for the price (free), can you really complain? After flushing, toilet runs for about 10 mins, very noisy. We were offered a new room but it's not such an issue as to have to move rooms. The guy on the night shift didn't even look at us when we came into the lobby, let alone say hello - i appreciate friendly staff, especially those in the hospitality industry.. so that was a disappointment after the super friendly people we had experienced so far. For the price and what you get, this place is really good value. I'd give it 3.5 stars if i could select that, but it's not quite a 4. Worst breakfast ever ! Hotel room are noisy, people running on the holloway, jumping on the room above mine, and the worst breakfast ever. I always stay at Best Western because I tough all have to be the same, but No. This one is the worst, the continental breakfast are not like others, doesn't have pastry, bagel, bread, yogurt, nothing. They only gave you a cold and bad coffee and a plate with 3 pieces of fruits, oily and cold scrambled eggs and hash brown. Stayed 5 days but had to go out to have a decent breakfast. NEVER will come back! This hotel was good price and offered free shuttle and breakfast. I would consider this hotel again in the future. Breakfast was good and neighbor hood was ok to walk around. We went to Long Beach from this hotel and it was a quick drive. Stayed three nights and that was enough. The rooms were ok but only just! The breakfast was very strange with 4 options to choose from that were slightly different from each other. Not really what you expect from breakfast and not HOT!!!!! Woman serving was very unpleasant and unhelpful. Reception staff were a little better but not forthcoming with information on the area or local restaurants or attractions. "Manager visits room at 2am"
This hotel is nice because of its special park and fly rate whereby you can stay one night and park 7 days free. As an LA resident I use it for early AM flights out of LAX. However at 2am my door flew open and the lights turned on and a man entered the room without knocking. When confronted he did not identify himself but left the room and left the lights on, forcing me to get out of bed to turn them off and investigate. Needless to say no more sleep was had this night. When I complained to the front desk about this, the clerk told me that it was the manager and he thought the room was empty with no further explanation. No apology. No offer to compensate. The attitude was "yeah, that happens sometimes, we go into people's rooms at night". Any hotel worth beans would have apologized profusely and offered some compensation. But not here. Weigh the convenience vs. the bizarre factor here and decide if free parking is worth the inconsideration. Good place to stay, we were going to Gardena for a family trip. Willing to stay there again, it was four families that stayed there with us. They all liked the location, and felt safe and restaurants are really close. 3 friends and I basically only needed a clean place to stay during our week vacation in Los Angeles. You can tell the property is older, however we found our room to be very clean and comfortable. The only reason I'm not giving it 5 stars is the breakfast. Upon check-in, they give you tokens. Instead of a typical help yourself breakfast bar, you give your token to the worker and they serve you a single serving of 1 of 4 different options. We thought it was a little weird and random. Overall though it was a solid hotel if you're looking for a clean place to stay during a busy trip. Not your glam hi-end hotel that is 5 minutes from the airport. It is a very nice warm, clean and friendly hotel. Safe area. Hotel is about 20 minutes away from the airport but the accommodations and price can't be beat. Free 24 hour shuttle at your request, free breakfast, free internet, restaurant on premise, two blocks walking to great buffet, next door local Mexican food. safe neighborhood. Laundry facility and exercise room. Wow what more. They will always get you back and forth to the airport on time. My friend got a hotel 5 minutes from the airport and paid 3 dollars less then I paid for this hotel. They had to walk across the freeway to get to the fast food area in the night, no restaurant on premise, and no coffee in the room. I have stayed at this hotel a few times. Never had any problems. The rooms and bed are so comfortable that you can chill and relax all day without leaving the room. The only thing I wish they had was a microwave, which I believe they used to have at one point. Clean, nice breakfast, large room (two queens/ family room) Lots of shops and fastfood restaurants in the area. Would have liked a nicer restaurant close by and Lawndale really is a bit from where the fun stuff is. "Before a trip to China"
We have stayed at this hotel several times and it has always been a pleasure. Their stay-and-ly program is phenomenal. Their choice of an American or Chinese breakfast is a real treat. The neighborhood has some really great and exotic ethnic restaurants that make for a hard choice when choosing a restaurant for dinner. The prices are very fair at both the hotel and surrounding eateries. My wife always fits in a foot message within a block of the hotel. "great hotel for park sleep and fly"
great hotel...needed a hotel that was part of the "stay park fly" program..they did great..clean and neat rooms...the gentleman that drove the shuttle was on time and got us to the airport in plenty of time especially with us leaving at 5 am...also was there to pick us up a week later...with hardly any wait...would stay there again in a heartbeat!! "Another day in Business Accommodation Paradise"
The location of this Best Western was perfect for what I needed. And it was easy to deal with having to deal with entering the hotel always from the south (because of the large center divider in the middle of Hawthorne Blvd.) I found it fascinating that the breakfast was atypical of most Best Westerns--instead of a self-serve buffet of eggs/cereal/waffles/juice/etc., there were 4 choices, made to order, and one of the choices was chicken congee! "good for the money to spend one night between flights"
Average room, comfy bed, clean, quick shuttle to the airport. Decent value considering proximity to LAX. With loud cycling AC did not get much sleep, but overall not a bad motel for one night between flights. Definitely the shadiest Best Western Plus I have ever stayed in. The room was very dated, but clean. Not enough outlets for electronics available. The check in process was smooth, we were given tokens for breakfast that we did not use due to an early flight out of LAX. The hotel has a definite motel vibe and we did not feel safe to venture out into the area, so we ordered in Pizza Hut. I stayed here on points so I really can't complain. Very close to the airport, shuttle service on the hour was prompt and quick. "Interesting hotel, nice place to stay"
Very nice hotel, close to the airport LAX. I stayed here on friday the 16 th of october. I called the (free) shuttle bus from the airport, and they were there in 15 minutes. A very very very nice (Mexican) driver! What a blessing is that man! (he is working allready 30 years for the hotel) The frontdeks man was a sweetheart, a happy man. The room was GREAT, very big, clean, it smelled zo nice, and what a soft bed!!! Wow! Breakfast wonderful wiht lovely lady's who served it. What more can you wish??? This hotel is very convenient for the Park, Sleep, and Fly program. 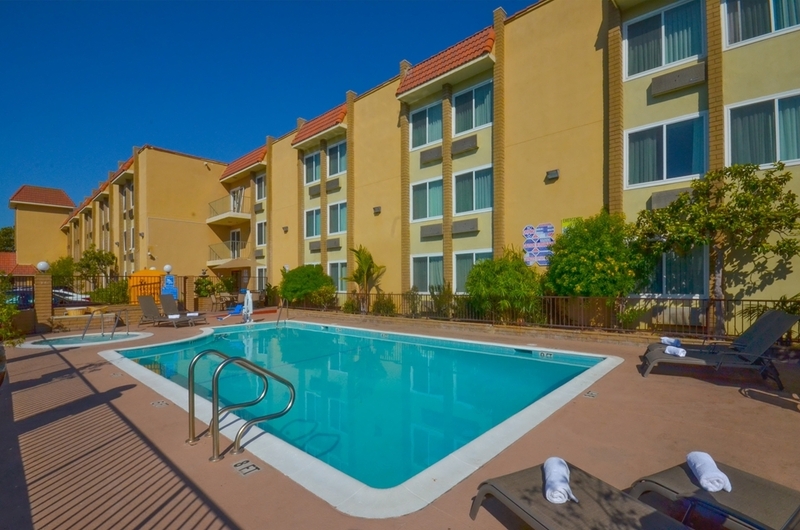 It is reasonably priced compared to other hotels located near LAX. They have a shuttle service that is always on time. The addition of the small restaurant is convenient. But would like to see microwaves added to the rooms for very early or late arrivals when the restaurant is not available. "Employees' families like the pool!" Tired and worn, the hotel lacks A/C thoughout the building, except for the rooms. The lobby, hallways and elevator were open to the outside air, which was 97 degrees that day. The small pool, which is 8 feet deep, was primarily occupied by the shuttle bus driver's family. All seven loved the small pool, to the exclusion of the guests. His uniform shirt and marked shuttle bus made it easy to identify him. Stayed here for three nights. The staff is very polite and service minded. Our stay included breakfast and you had four different choices - tasty but very small portions. Spacious rooms but the A/C is difficult to set - it´s either to cold or to warm. The very big minus are the high and stiff pillows - if you prefer to sleep on your stomach you will wake up with the worse neck ache. Perfect with complementary transfer to and from LAX. There are some restaurants around where you can eat lunch/dinner but the area feel a little insecure at night. "fine for a short visit"
Average hotel but the right price for two nights while our house was getting tenting termite treatment. first day all was good and was glad to air con during a Oct heatwave. Decent pool and jacuzzi but too many kids in it for our taste. good places to eat within walking distance. the breakfast that comes with the room is just okay - no variation - you have 4 options and that is it. the muffin was stale. thankfully there is a nice *bucks less than a half a block away. 2nd night there was power outtage. i do not feel they handled it very well. our hallway did not have any emergency lighting - that i am sure is a safety hazard. minimal communication about it and a rather cavalier attitude. the shuttle service is okay - but the driver did not speak english - which made for a challenge. The Airport Shuttle is the only reason we stayed here for a quick one night stop before flying home. After a 5 hour flight, swollen legs and ankles we called the hotel when we landed and were told to call when we got our luggage, within 10-15 minutes later when we got our luggage and walked out to Hotel Shuttle sign we called back the guy was screaming on the phone, said he couldn't hear us and hung up! We made a second call and the same guy said it would be 30 minutes, within 5 minutes the shuttle driver shows up along with other riders that told him it was fine to come back and get us! Thank-God! Check-in was easy but finding our room at midnight wasn't...it was down one dirty hallway after another, finally got to our room, it was hot, the walls were thin and all we heard was the tv left on by the guest next to our bed, we just blasted the air for the night and blocked out the sounds! Breakfast the next morning was in a restaurant, which was nice to have real plates and silverware, they offer guests 4 choices, which came fast as we were rushing out to the shuttle for an early morning flight. We were hoping to find a hotel next to the airport for all our quick trips into LAX, but unfortunately this is not it! Old hotel that needs immediate attention of repairs, cleaning, carpet dirty and overall decaying appearance. Night receptionist was unfriendly and could care less of guests needs. What Continental breakfast? It is a joke, it is actually a restaurant with very poor service, given only an option of 4 items in the menu and coffee served cold and servers expect a tip. This is not your typical Best Western Hotel. Stay away! "Be prepared for a cultural experience"
This hotel is extremely convenient for me to visit family in the area and it is fairly easy to get in and out (and the price is certainly attractive versus other hotels in the area). They were also very adaptable to my schedule to allow me to check in early (noon) because they had rooms available (my parents came a day later and couldn't because they didn't have clean rooms). Parking is semi-private and I felt secure on the hotel premises - I would even feel ok walking the main streets around the hotel to other businesses/ restaurants during the day. The hotel itself is older, but it has been renovated in the last 7 years (possibly less), so the carpets & walls are a bit dingy and the elevator has seen better days. I would not say the hotel is dirty, just not 'new.' The sheets were clean, but the towels have been used a while (the towels are comparable to a 2-star hotel, not a typical Best Western Plus). The hotel offers shuttle service to/from LAX and this is very convenient for my family. The hotel caters to visiting Asian (Chinese speaking) clientele. This is clear in the internet access (directions provide both in English and Mandarin), the signature line on the check-in is only about 1" long (typical for Asian signatures), and the restaurant. Yes, they serve breakfast in a restaurant, but I believe this is more about portion control than a true restaurant. They have put as many tables/ chairs in the room that the fire martial will allow and it is extremely tight (don't try to take any luggage in with you). The menu has 4 options with pictures for each and brief descriptions in English and Chinese, including 'congee' as an option. The breakfast is small, but I found it adequate: 1 scrambled egg, 2 pieces of meat, a pancake or slice of toast with a small bowl of fruit (there is another option, but I forget those details). All items were prepared in advance and sit under heat lamps or possible chaffing dishes (I didn't see, but given how fast my breakfast came one morning it wasn't freshly cooked). I didn't see the restaurant open for anything except breakfast, but I wasn't looking to eat there for any other meals, either. There is a *-bucks behind the hotel, so this might be a better breakfast option for others. One area I should specifically comment on - the beds are average - they are not hard (the one aspect of the hotel that doesn't cater to Asian clientele - unless they have rooms specific for Asian clientele with hard beds, which I didn't stay in). I find the bed comparable to other Best Westerns. I've spent an extensive amount of time in Asia and as long as you are ok with the cultural experience, this is a nice hotel to stay at. If you want a typical American hotel experience, I'd recommend staying somewhere else. It was a very nice place to stay for the weekend. The room was clean and quiet. My grandson loved the pool! For the free breakfast they do not give very much food but it was good. The staff was friendly and helpful.